Valve May Be Entering the Console Market with "Steam Box"
New evidence suggests Valve's developing a high-tech console to compete with the current generation of consoles. A new rumor circulating about Valve's next big project may disappoint those eager for news on Half-Life 3. According to an article posted over the weekend at The Verge, Valve has apparently been developing hardware and software for a potential gaming/PC console, and demoed a hand-built prototype of the supposed "Steam Box" at the 2012 International CES this past January. Potentially aimed at taking on Apple TV and the current generation of gaming consoles, the rumored Steam Box includes some impressive gaming hardware, with 8 gigs of RAM, a Core i7 CPU and a high-end NVIDIA graphics card. It's been suggested that Alienware may have had a hand in its development, and that its Alienware X51 computer was designed around an early version of Valve's new console. The Steam Box will come with a proprietary controller that may include biometric sensors (like the ones Valve uses when play testing its games) along with customizable components that allow users to reconfigure the controller based on what game or application they're using. 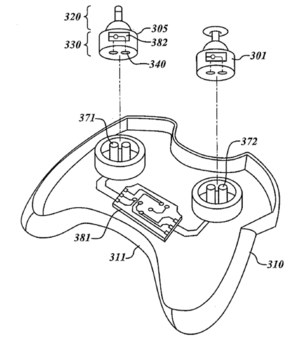 Valve filed a patent on such a design last year. Another rumor floating around is that Valve isn't intending to build and launch this console on its own, and may be looking for partners to help get its console off the ground. Additionally, the Steam Box will also support Valve's "Big Picture" mode, an upcoming feature that gives users access to Steam via the "biggest screen in the house," a.k.a. their television. Valve might reveal more information on its Steam Box this week at the Game Developer's Conference, or possibly later in the year at E3.